Internet marketing is one of the most important activities you can do to build your business fast. These days. almost everyone has access to the internet either on their personal computer, at work or school, or in the palm of their hands with a data connected device. It just makes sense to use this powerful platform to market your business products and services to potential customers. Social media is the easiest internet marketing tool to do exactly that. There are hundreds of social media platforms out there. There are microblogging platforms like Twitter, image platforms like Instagram, and even video platforms such as Vibe and YouTube. As an aspiring entrepreneur or bootstrapping business owner, how do you choose which of these social media platforms will make the most strategic sense for your specific business and marketing needs? Just as anything else in entrepreneurship, the hardest part is just to start. To get you started, there are really just 3 primary social media platforms your business must be on to begin building your internet marketing strategy. As you grow and learn more about your dream customers’ needs and interests, you will be able to further expand your online marketing strategy to include additional, relevant social media platforms. Facebook is a social media platform that allows you to easily connect with friends and family. Almost everyone has a Facebook profile and most other social media platforms are integrated with Facebook to allow easy, one-click, universal login. Your business can take advantage of Facebook by creating both fan pages and groups. Your Facebook fan page should be named using your own name, if you are the face of your brand, or the company name. Fully build out the fan page profile by including the address and other contact information as well as a full description in the “About” section. You may also want to integrate additional tools like vCita’s appointment setting tool that will become an easy call-to-action tab on your fan page allowing potential customers to connect with you directly. Groups are a highly effective customer attraction tool that when used correctly can lead to massive lead generation with very little concentrated effort. Building Bridges Consulting helps small business owners and aspiring entrepreneurs set up Facebook groups to take advantage of this powerful marketing method. Google+, or Google Plus, is a social sharing platform owned by Google. Google+ is an often overlooked tool without good reason. Since Google actually owns this social media platform, any content posted to it is indexed by this powerful search engine within seconds. We’ve tested this with our own posts and have seen instant results for very broad keywords and phrases. It works! Use hashtags for your selected keywords to maximize the effectiveness of internet marketing via this social media platform. LinkedIn is a professional networking site. Every person who uses LinkedIn understands that it is meant for business. This works in your favor for a couple of reasons. First, it cuts down on the need to hide your true motives behind wanting to establish a relationship with them. Not only is it assumed that each person on LinkedIn is there to expand their career in some way, it is actually expected and encouraged. Second, almost half (49%) of LinkedIn users report having an annual household income of over $100,000. This means that over 100,000,000 people using this social media platform are most likely able to pay your prices. LinkedIn can also be used in many of the ways that Facebook can. You can create a business profile and host groups aimed directly at your target market. Your social media strategy can start off very simple by creating at least these three social media business profiles. Each platform has many benefits including direct access to your dream customers. Once you have become familiar with how to incorporate these social media platforms into your internet marketing efforts, you can then move on to additional social media tools that will further expand your brand. Building Bridges Consulting can help! If you need support to figure out exactly what to put on your social media business profiles or how to use groups to easily capture and convert sales leads, request a free Business Breakthrough strategy session today. 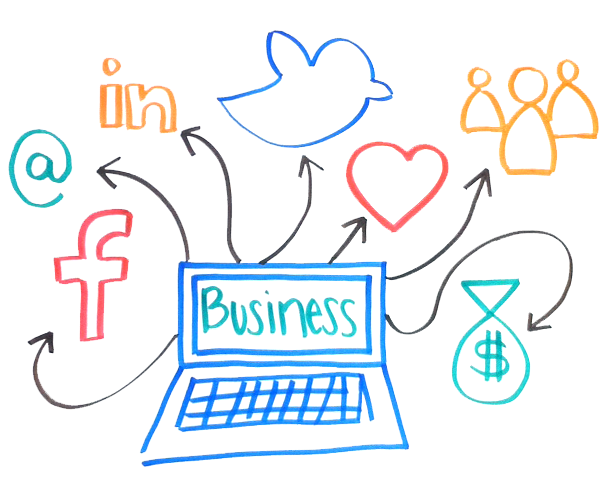 What social media platforms have you found to be most valuable in your online marketing efforts? Let us know in the comments below. If you found value in this post, please share with your network. This entry was posted in Social Media and tagged entrepreneurs, Facebook, LinkedIn, social media, Twitter on July 7, 2015 by buildingbridgeschicago.